In Singapore, you only give red packets (hongbao) after you are married, as this is traditionally viewed as becoming an adult. As an adult and senior, you give hongbao to juniors to wish them good luck. As you know, people get married young long time ago but it is common to be still single after 30s now. 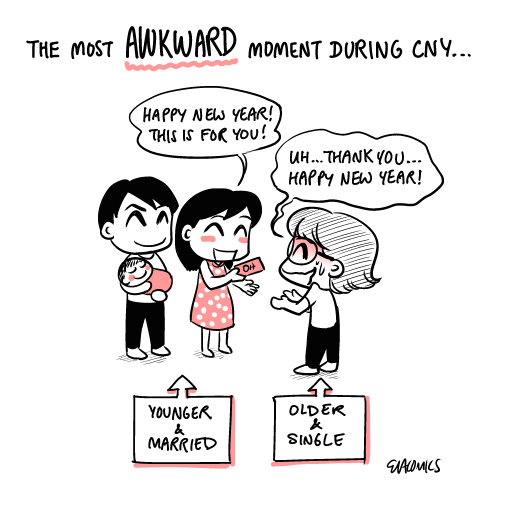 So this creates an awkward moment to receive red packets from younger relatives (like 5 years younger?) . Wishing everyone a great new year with good health, fortune and career!